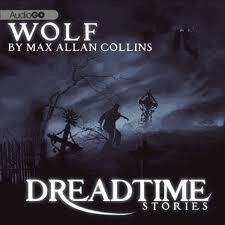 Wolf is the last of the Dreadtime audiobooks I have gotten a hold of. I have left Wolf till last as I really don't find werewolves to be very interesting monsters at all. Not as bad as I feared, saved by the wonderful Malcolm McDowell. Wolf follows the middle age womaniser Jack Wolff who is staying at a holiday resort searching out his next prey. Since he was very young Jack has been after women to fulfil his appetite, it seems he is a werewolf. He has set his sights on a pretty 15 year old girl who he wants to take as his next conquest but is there more to her than meets the eye? Wolf was the shortest of the Dreadtime stories I have heard, somewhere between 30 to 40 minutes. Luckily this has by far the most Malcolm McDowell narration, it seemed he had at least a good third of the audiobook time. The story was different in that the actual werewolf part was very slim, most the tale concerned how Jack Wolff hunted his prey, his methods for choosing who he wanted next as his victim. A few problems with this though, firstly the werewolf scenes are confusing, it is hard to have someone being ripped apart just by audio and have a good idea of what is happening. Also a spoiler here but I am not 100% sure if Jack Wolff was actually a werewolf or not, it was never made clear.